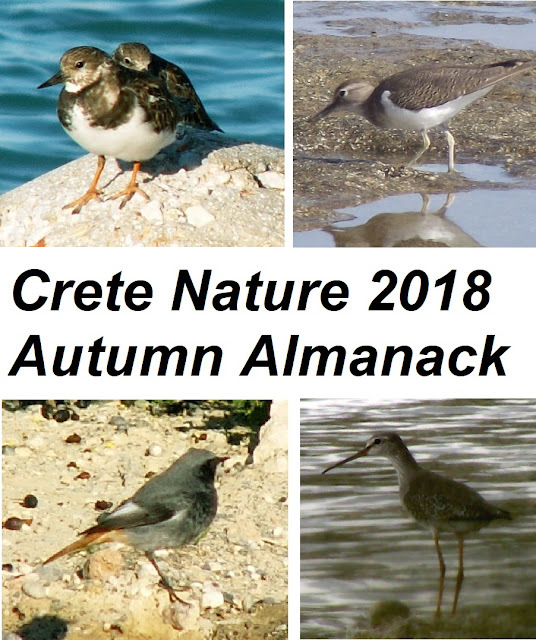 Autumn is nearly upon us and the birds are already flying south from northern Europe and either staying or passing through Crete on their way to sub-Saharan Africa. Find any stretch of water and you are likely to see birds such as Ruddy Turnstones, Arenaria interpres (top left); Common Sandpipers, Actitis hypoleucos (top right); and possibly even a Spotted Redshank, Tringa erythropus (bottom right). Look out also for the first appearance of the Black Redstart, Phoenicurus ochruros (bottom left), which usually arrives down here on the south east coast somewhere between late October and the end of November. Yes, the autumn equinox is nearly upon us and it's time for me to stop loafing around and take you trundling off around the natural beauties of east Crete once more. Only this time you really can come with me. Series 8 is called Steve's Sunday Strolls and I'll be giving you a couple of weeks notice of where I'll be at 11am on Sunday morning and you can either join me or avoid me, as is your wont. For instance, on Sunday 23rd of September I shall be here in Sisi. We'll do a bit of rock pooling along the front and see if we can find some Dice snakes (don't worry, they're not dangerous). Then we'll go around the harbour and explore the inlet and the woods along the far side and finally, if time allows, we'll see if there are any nice birdies out on the spit. Then it's back to the Plori Restaurant-Cafe where we can chat about what we've seen and I'll try and identify anything that you've photographed and tell you a bit about it.